The Sassy One: the little one. 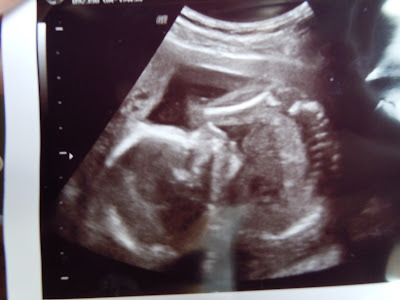 this is baby's profile with the legs bent over the face. You can see the spine in the bottom right. Yesterday was our ultrasound. It's funny, I was a little anxious over it for the weeks leading up to it. I have probably read way too many stories/blogs, but I know that the most unexpected of worries can show up at that ultrasound and that scares me. I invited both of my parents to go with us, so that was a fun experience to share with them. I wasn't too terribly concerned yesterday as we made the trek to the office. And our ultrasound experience was perfect. The tech was amazing, and she did a great job at pointing out every single thing. It was also nice to find out that I look like a whale and baby is curled up with the legs folded flat over the face (think: folded right in half). The tech had to work at getting baby to move around so she could get everything, but she did get to look at it. And she found out the gender. It's still a surprise to us, though after seeing baby, I got intense feelings that it's definitely a boy. I should have prefaced that with my thoughts about Ruby's gender all the way until birth: they were the same. I was so sure she was a boy. I don't know, I will be shocked if this baby is a girl, I think. I am so thankful for a healthy little one. We went to Kohl's and I celebrated by buying out there entire gender neutral section. Um, that was two whole outfits. We'll wait until baby is born to find some cute gender specific things. Although, I am going to have my work cut out for me finding baby boy things that are as cute as Ruby's clothes. We went out for dinner to celebrate, and we made last night the fourth consecutive night that Ruby and I have slept less than five hours total. Looking at the three nights prior, I'd say five hours should have been considered sleeping in. But I have never been this tired in my life. 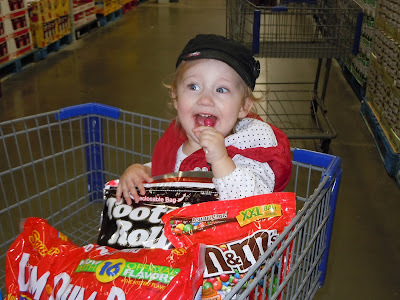 This was at Sam's in her papa's cart. I'm pretty sure she'll never want to ride in my boring cart again.